This week is national chocolate week here in the UK. As my boyfriend Neil and I are big fans of the stuff, there is almost always some chocolate hiding somewhere in our fridge or cupboards, begging to be included in the next big baking session! Over the past few days, I have been practically salivating over all the decadent, rich, chocolatey recipes I have come across in the media, not to mention some of the fantastic events that are happening across the county all in the name of chocolate; it appears that we are not alone in our favouritism of the stuff! One of the most simple yet decadent chocolatey bakes has to be the ever-so-popular chocolate brownie. I find that there are many different preferences where brownies are concerned. Apparently the first chocolate brownies, which were developed at Palmer House Hotel in Chicago at the end of the 18th century, featured an apricot glaze and walnuts however, there are many myths surrounding the creation of this much-loved bake. Today, some people prefer nuts or cherries to be added to the mix, others prefer rich dark chocolate and others argue that creamy milk chocolate brownies are the way forward. I am pretty flexible but one thing I cannot abide is dry, dense, cake-like brownies. A coffee shop I used to work in many years ago used to advertise dry and crumbly pieces of chocolate cake as ‘brownies’ which was a mortal sin in my opinion! Me? I love brownies that are almost under-baked and still warm from the oven. Crisp on top with gooey chunks of chocolate in the middle, the kind of brownies which melt in your mouth and are gone in an instant, leaving your begging for more! With the above in mind, I thought that I would post a divine recipe for gooey, fudgey, melt in the mouth double chocolate chip brownies based on a recipe from allrecipes.co.uk. 1. 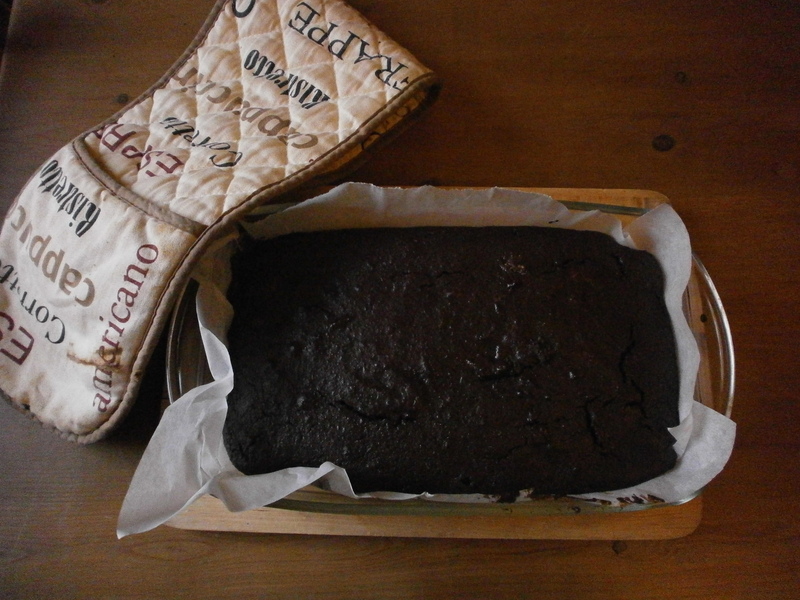 Grease and line a brownie tin with baking parchment and preheat the oven to 180 degrees. 2. Chop or break the white chocolate into large chunks. 3. Measure out the margarine and sugar and cream together in a large bowl. Stir in the vanilla extract. 4. Add the eggs to the margarine and sugar mixture one at a time, ensuring all ingredients are well incorporated. 5. Place a heatproof bowl over a small pan of simmering water. Break up the dark chocolate and place in the bowl, stirring frequently whilst it slowly melts. 6. After all the dark chocolate has melted, remove the bowl from the heat and allow to cool slightly. 7. Sift both types of flour into the mixing bowl, along with the cocoa powder. Add the melted dark chocolate and combine. 8. Finally, stir in the large chunks of white chocolate and pour the mixture into the prepared tin. Please note that the batter will be fairly rigid and will not pour easily. 9. Bake in the oven for 40 minutes. Remove and allow to cool before cutting into pieces. You may wish to check the bake after 30 minutes as ovens do vary! The aim is for brownie to be flakey on top with a gooey chocolate centre. You can test this by using a skewer or tooth pick; unlike a sponge cake there should be some chocolatey residue on the skewer when pushed into the centre of the brownie. I hope you enjoy the above recipe. I recently made these brownies for a colleague who said that they disappeared pretty quickly; they certainly don’t hang about in our house for very long! Here’s to chocolate week, more decadent recipes to follow! 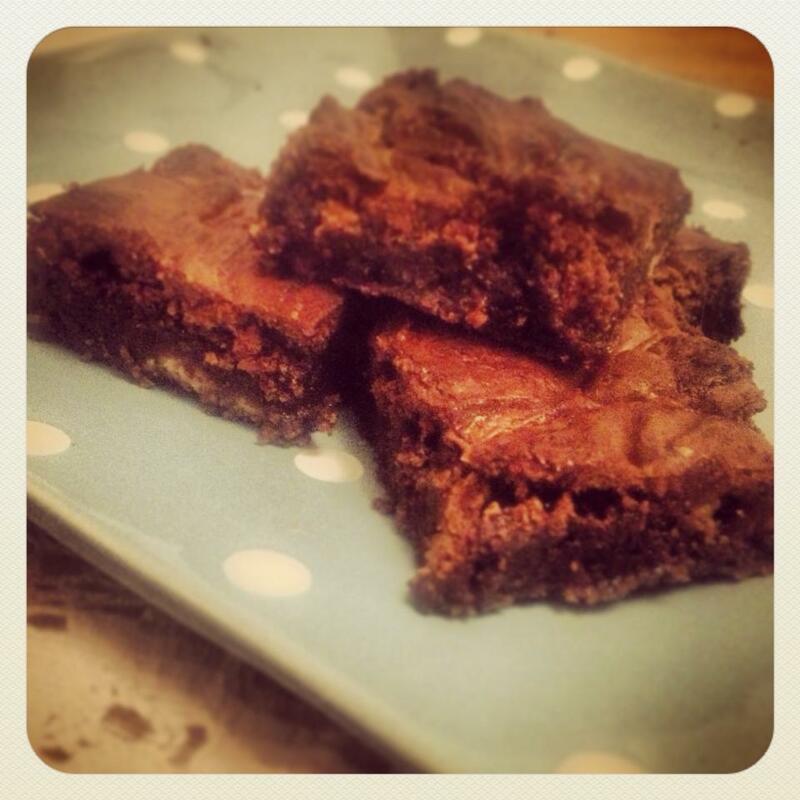 Be sure to check out my other brownie related posts here and here! That’s right, I said “low-fat”, “chocolate” and “brownies” in the same sentence!!! 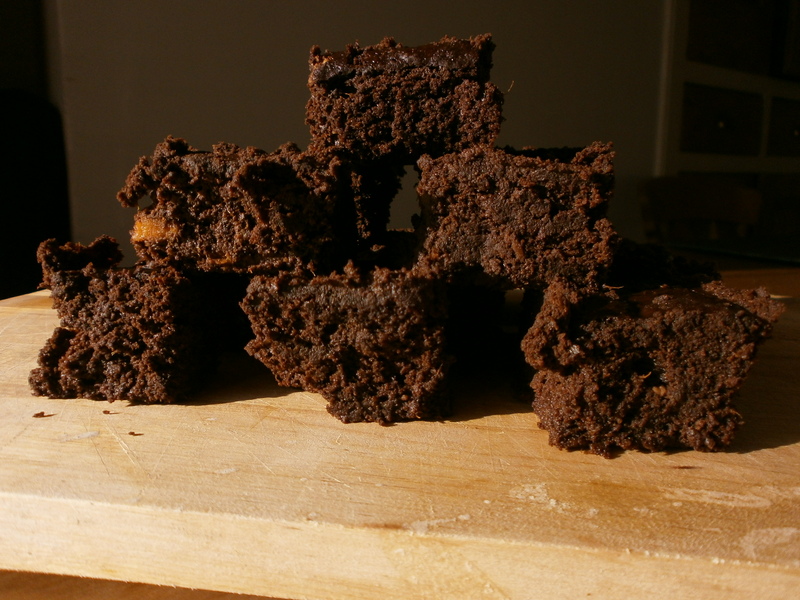 I promise you there are such things do exist…tasty, rich and gooey low-fat chocolate brownies…I am not telling you a lie! I think I first saw this recipe on Channel 4’s ‘Cook Yourself Thin’ a few years back. The series was quite good but the cookbook and recipes are even better; I still make some of them today and would definitely recommend purchasing the book. Unfortunately, the recipe for the brownies isn’t in the cookbook however, a low-fat chocolate sponge recipe (featuring beetroot) is in there and I can testify that it is delicious and tastes just as naughty as the real thing and I’m not even a beetroot fan! 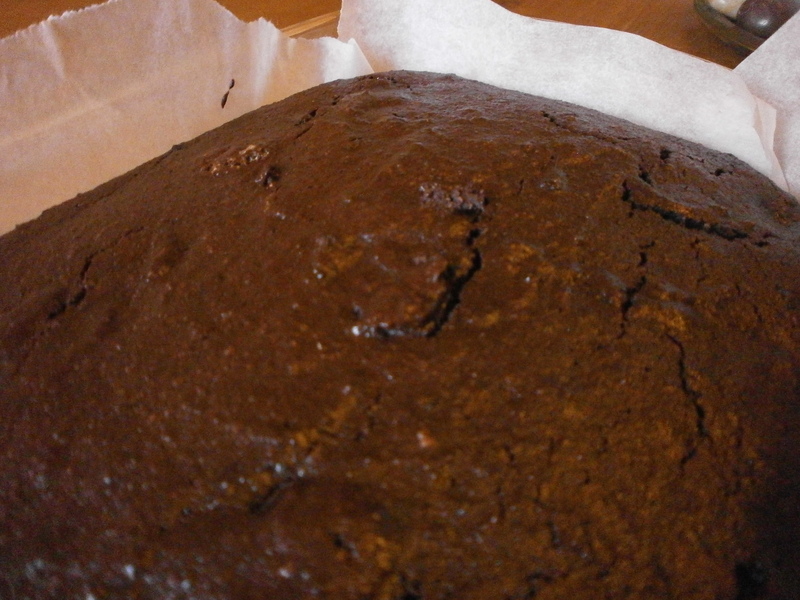 When I first heard of a brownie recipe involving sweet potato I was in complete disbelief. Mr MAC thought I was barking mad! I love sweet potato and I love chocolate but I couldn’t really see how the two would work together however, they most definitely do!! The sweet potato is used instead of butter/oil and the recipe only contains two tsp of flour; it adds a real richness to the brownies and gives them the gooey consistency. I decided to make these brownies on Sunday to take into work the next day. I must admit, I have never included the turkish delight as I’m not a massive fan – the recipe works really well without. Everyone at work seemed to enjoy the brownies (in fact some people came back for more) but no one could guess what the secret ingredient was! As written in my last post, on Friday we spent the day in Cambridge. 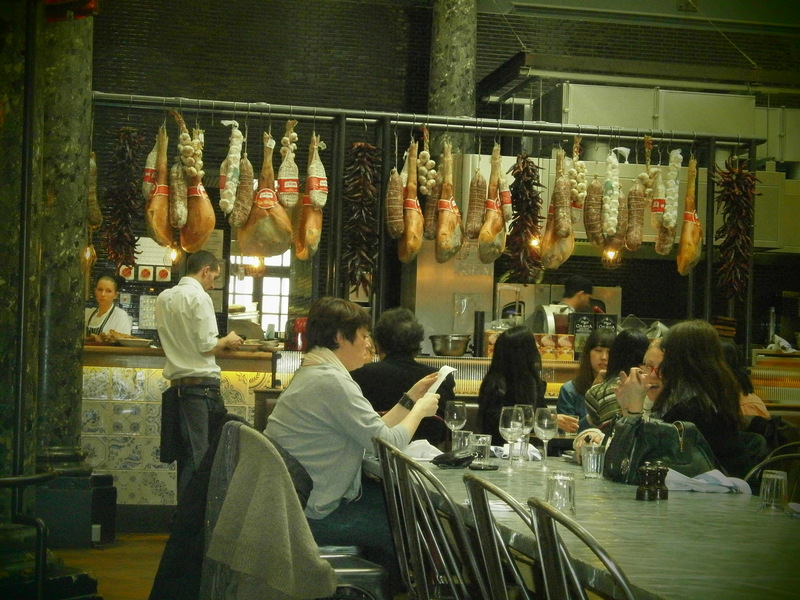 We had planned to visit Jamie’s Italian in advance of our visit and booked a table for 1pm. From the second we walked in, I was impressed. We explained to the Host that we had booked for 1pm but were 10 minutes early – she explained it wasn’t a problem at all and that they always ensure that your table is free in plenty of time for your booking. She promptly showed us to our table in the main dining room. The building is basically the revamped Guildhall, is grade 2 listed and it is truly lovely. The ceilings in the main room are very high, which gives the room a light airy feel, and there is a dome with stain glass at the top which gives a reminder of the history behind the place despite it having so many modern twists. I loved the way there were dried hams and bulbs of garlic hanging down from the preparation area and that you could actually see the kitchen and the chefs hard at work. I liked the ‘openness’ of the room; there were banquet type seats all the way around the room facing in which meant that it is a great restaurant for people watching and observing! One more thing about the decor, the old-fashioned toilets were made by “the venerable Mr Crapper”….something I found quite amusing!! Our waiter was really very good. I cannot fault the service. Just enough time was given to let us make our menu choices and eat our courses and we didn’t feel rushed at all. When describing the ‘Specials’, our waiter knew every small detail and appeared to have a real passion for food and flavours – something which I think can be quite rare! Instead of having starters, we decided to choose two ‘nibbles’ to share. 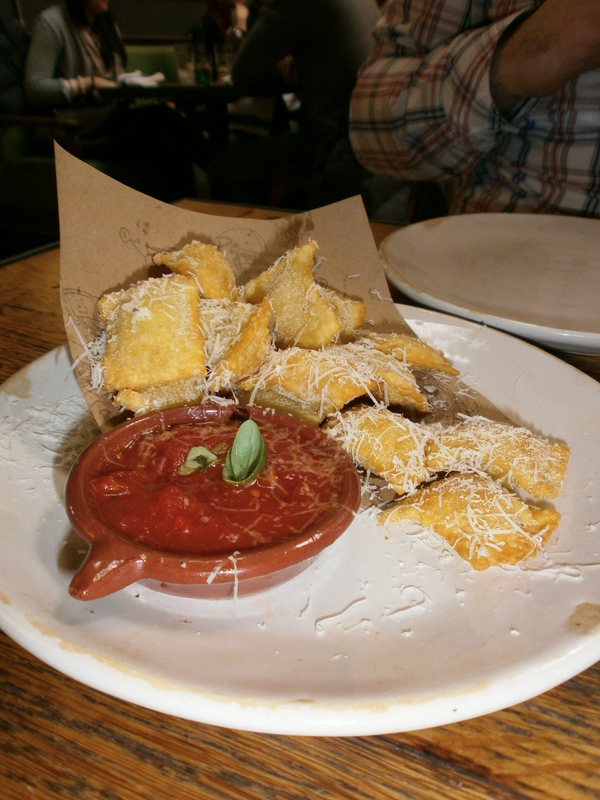 We chose the ‘Italian Nachos’; Crispy fried four cheese ravioli with a spicy arrabiata sauce, and the ‘Italian Bread Selection’ which consisted of homemade rosemary focaccia, sourdough crispy ‘music bread’, ciabatta and toranto with extra virgin olive oil and aged balsamic. We both agreed that the ‘Italian Nachos’ were a fab twist. Really crunchy on the outside yet soft and cheesy on the inside…yum! 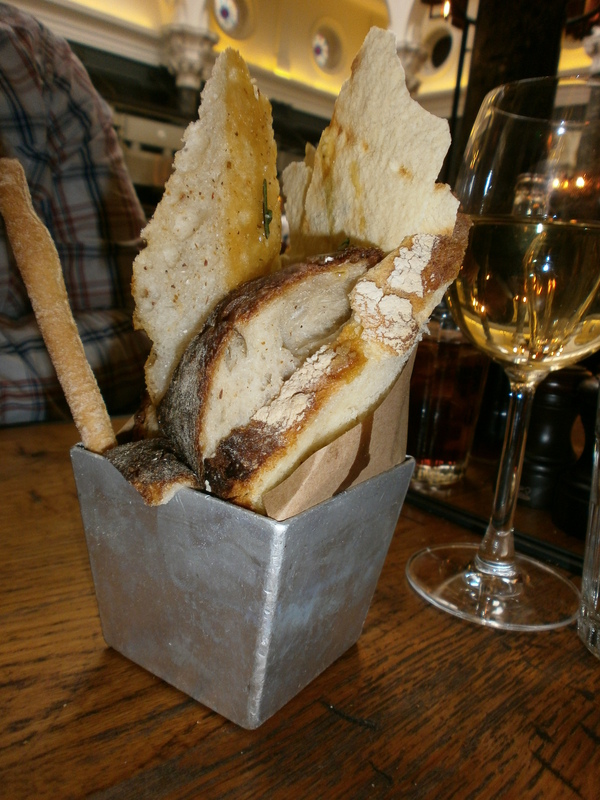 The bread was also really tasty and nicely presented. We appeared to have more garlic and herbs with ours and less balsamic (which was a shame as we both love balsamic) but it was still wonderfully fresh and tasty. In fact, we saved some to have with our main courses as there was quite a lot of it, not that I’m complaining! As you can see from the above, I had a glass of wine with lunch whilst Mr MAC, as the driver, had a diet coke. Unfortunately, silly me didn’t make a note of the wine I ended up having but I know it was organic and one of the house wines and it was truly delicious! I’m kicking myself that I can’t remember the name as would love to buy a bottle or two of it! Next for the main courses! It was so difficult to decide as they all sounded so delicious and I definitely want to take another trip to Jamie’s to try other options. I decided on the ‘Wild Rabbit Tagliolini’ which was described as being a slow-cooked ragu with garlic and herbs, marscapone and Amalfi lemon. I don’t eat rabbit very often so thought this would be a good choice and it really was! The rabbit was very tender and had a much more delicate taste than I expected. The pasta was creamy and silky. All in all a lovely dish but it was very filling, in fact I couldn’t quite finish it – I think next time I will go for the smaller portion of pasta if I’m having more than one course! 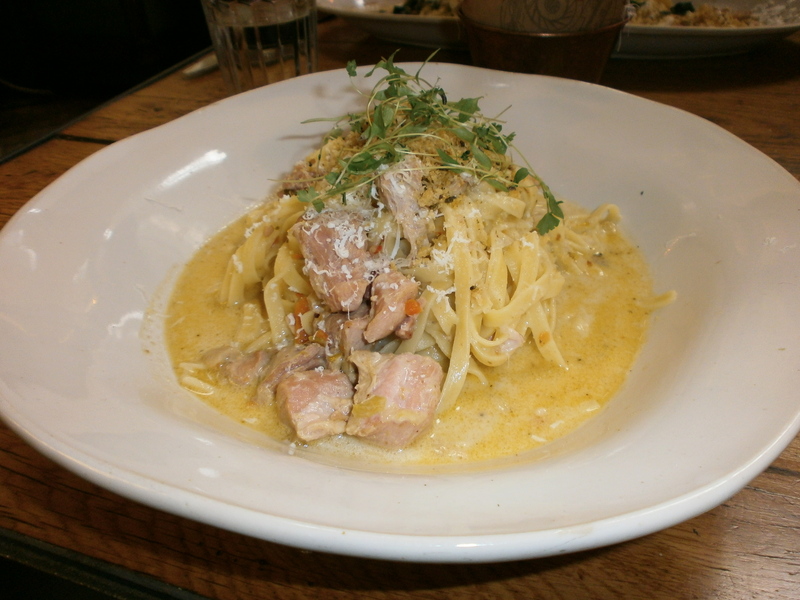 At the last-minute, Mr MAC chose one of the specials which was very reasonable as it was priced the same as the other main course pasta dishes. 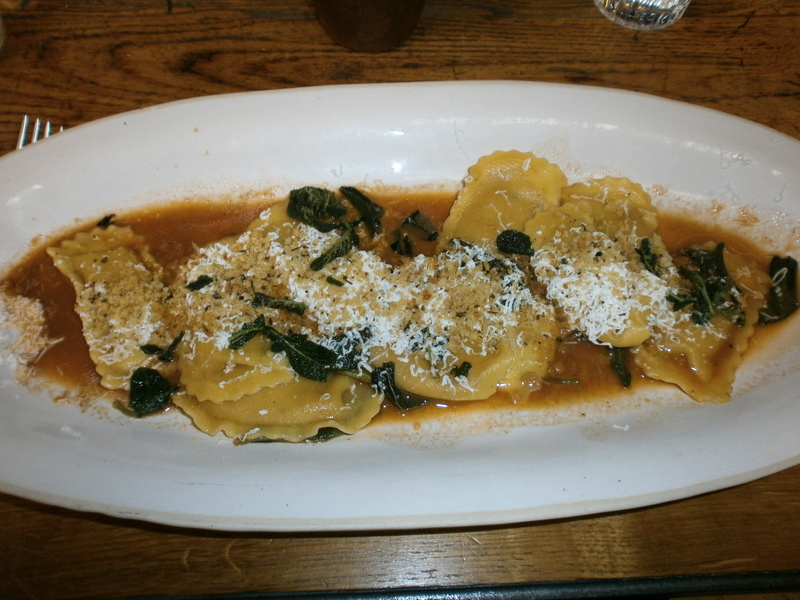 Described as pasta parcels filled with slow roasted lamb, red wine and ricotta, served in a silky sage and butter sauce, it was truly wonderful. The pasta was bursting with lamb and the sauce had a real depth of flavour. It was a rich dish but utterly decadent and the perfect lunch time treat. We also shared some ‘Posh Chips’ with parmesan and truffle oil. I wouldn’t say these were anything to write home about but not terrible either – distinctly average would probably describe the chips. I would have much prefered nice thick cut chips but oh well, it was nice to try something new! 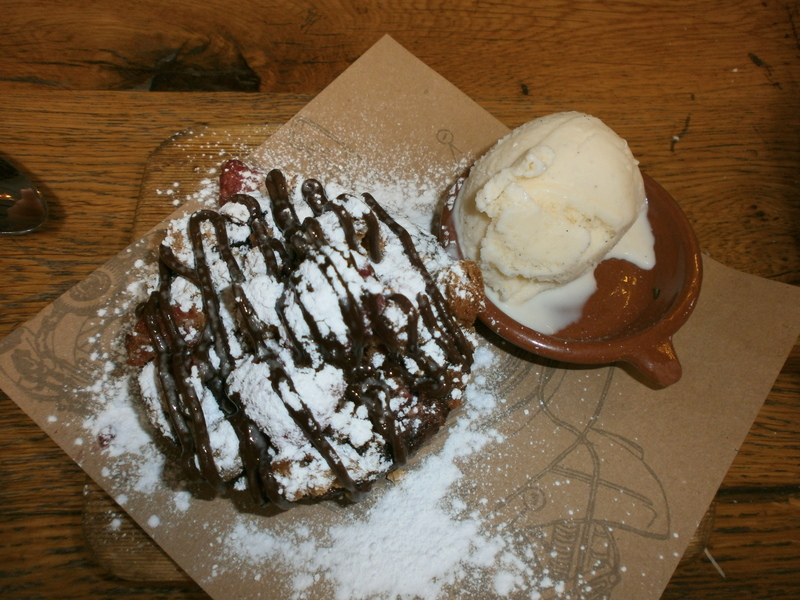 At this point I really was very full but, I have a terrible sweet tooth and just couldn’t say no to a dessert I had spotted earlier ‘JI Warm Brownie’; a chocolate, raspberry and amaretto brownie with vanilla ice cream. This dessert combined some of my absolute favourite foods and it really was very good. I could most definitely eat another – all the flavours were perfectly balanced, complimenting each other but not overpowering. I also think there is something to be said for really good vanilla ice cream and this really was – vanilla specs galore! Mr MAC didn’t overindulge like me but he did have a spoonful of my pud. As detailed in my last blog, he was more pleased with a jam donut from the market!